There's nothing new or novel about a fast food chain getting weird or snarky on social media to get attention. In fact, Wendy's has pretty much turned that move into an industry standard. 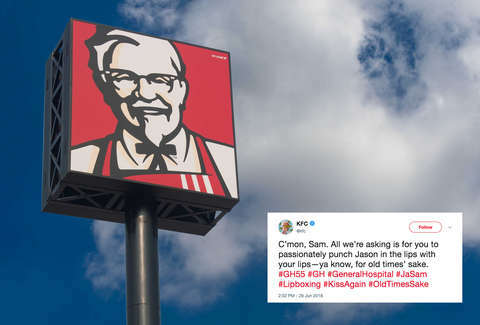 However, what KFC has been doing this week on Twitter has many people perplexed, after the fried chicken chain's official account started posting exclusively about the soap opera General Hospital. The mysterious series of Tweets began on Monday, when KFC posted something about "CC" and morse code and a place called Floating Rib with the hashtags #GeneralHospital and #GH55. Discerning followers familiar with the long-running soap were quick to realize whoever was manning the Colonel's official handle was talking about the show, and actually referencing the episode that aired that day. The saga continued Tuesday when it posted some ramblings about how Jason should find a new job. Wednesday, the account left some opinionated comments about Michael and Nelle. And on Thursday, it promoted punching Jason in the lips. Needless to say, it's all a bit confusing, even for rabid fans of the ABC staple, which has been on the air for a whopping 55 years. Unlike a soap opera you've watched religiously, KFC's bizarre social media move is a bit hard to follow. It's unclear what this stunt is even remotely about at the moment. Its latest product launch was limited edition pickle fried chicken, which debuted on Monday, but it's tough to see how that could be connected. There also don't seem to be any working theories quite yet on what the endgame is here, and who knows how long the seemingly irrelevant messages will continue. But you have to hand it to KFC considering the fact that you're even reading about it right now proves its already accomplished what it presumably set out to do: get your attention.